HBCUs have gotten love on Strahan and Sara twice in the past week, including Michael Strahan’s alma mater. Texas Southern’s most famous athletic alumnus gave his alma mater some love ahead of its bid for a post season title. Michael Strahan sent out well-wishes to Texas Southern on “Strahan & Sara” on Tuesday morning as it prepares for its final in the College Insider Tournament. Texas Southern will take on the University of Wisconsin-Green Bay on Tuesday night at 9 PM.The winner will advance to meet the Hampton-Marshall winner in the championship game. Strahan finished his career at TxSU in 1992 before being drafted by the New York Giants. It’s the second time in as many weeks that HBCUs have gotten some love on the show. 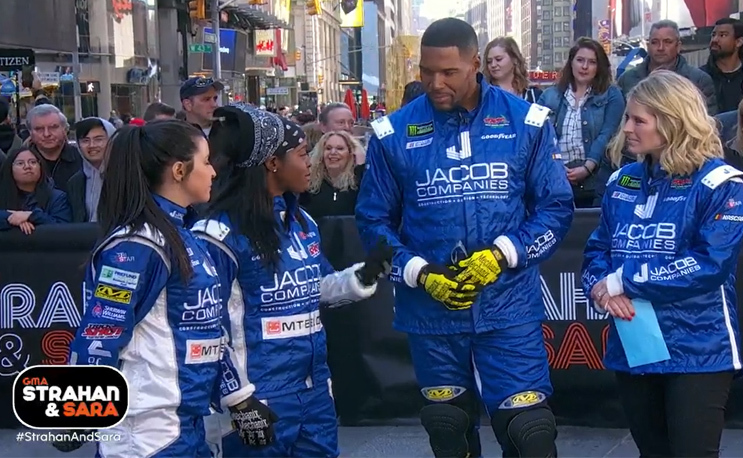 Last week NASCAR crew members Brehanna Daniels and Breanna O’Leary talked about their road from HBCUs (Daniels went to Norfolk State, O’Leary went to Alcorn State) to pit road. Daniels spoke about how former Norfolk State Director of Compliance Tiffani Sykes pushed her to tryout for the NASCAR Drive For Diversity program, which led to her making history. Big shoutout to “Strahan and Sara” for giving HBCUs a voice on their show.